I had a sudden burst of energy and thought maybe I’d try to get one more toy pattern out in time for Christmas gift giving. I’m thinking boy gift and also thinking quick and easy. With these two criteria in mind I’m using fleece to draft this little guy and I have to say it’s turning out pretty cute. I know fleece isn’t everyone’s favorite and it’s definitely not scoring points on the natural materials scale but it’s super easy to work with, cheap and really easy to find. And it’s soft and the kids love it. Sometimes there can be so many hurdles to actually completing a project, ordering supplies from different online sources or scouting all over town for the perfect fabric. I was thinking, especially during Christmas stress-crunch time, wouldn’t it be nice to walk into a Joanns, Hancock Fabrics or Hobby Lobby with $20 and be able to get all your supplies to make something cute! I’ve been wanting to make a monkey forever and thought it’d be perfect for this project. Using some of my favorite storybook monkeys as inspiration, I came up with these guys. They’re a little different from each other but I think the final design is there between the two of them. The sitting monkey has a shorter tail because dang, stuffing a long skinny tail is not exactly what I’d call relaxing crafting. These guys are great! I have a 5 year old and an 8 month old and I think they would BOTH love the monkey twins. Were monkeys the sidekicks of the Wonder Twins, or am I remembering my 80’s cartoons incorrectly? Either way, I love them! you must have read my mind (without knowing me, or even knowing that i existed! wow!). i was just last night thinking that i needed to find something exactly like this to make for all the little ones in my life. perfect! i’ll be watching for the pattern! Oh, please please please get this out in time for Christmas!! 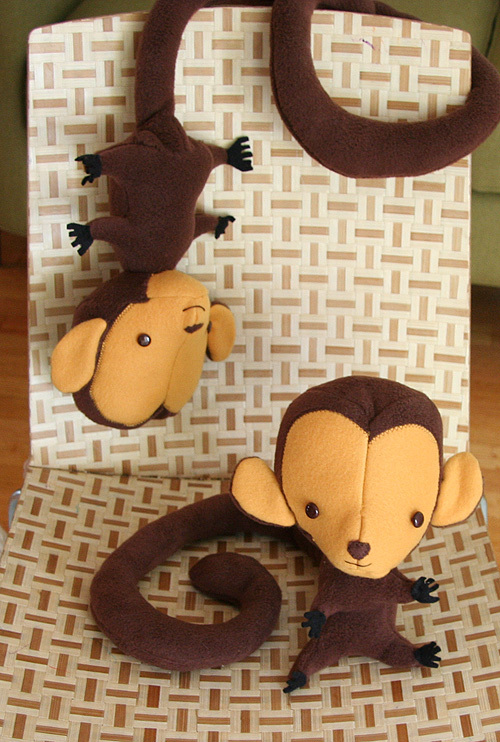 This would be a *perfect* gift for my nephew, we are all monkey obsessed! Love!! These are awesome! My three and a half year old just told me he wants a monkey for christmas. May have to be something like this:) Cause he’s def NOT getting a live one! Oh those guys are SO SO SO cute!!! LOVE them! Oh my god those guys are too cute! Just darling! I’m a fan of the classic sock monkey, which can be made from all types socks, including the soft and fluffy kinds. However, my LEAST favorite part of the project is stuffing the tails!!! You hit that one on the head. Those are darling! I had already committed myself to Spaceboy and Robot for Christmas for two boys, but they might get bumped by the monkeys! Oh, so, so cute! I love the little faces. And those tails! I think its fantastic that you are doing monkeys and they will be the most fabulous monkeys ever. You are a big inspiration! Monkeys rock and so do you. Sweet. ooh, I love them both, twins they should be! your work is so whimsical and fun! They sure are cute, but the one on the ground? His head looks a lot like a hedgehog, no? Que bonitos son esos monos!!! Those are very cute. I like the face on the hanging one. Very cute! My girls would love these, and so would their cousins. Great idea, can’t wait till you are done. oh wow – his big ‘ol head is just freakishly cute and my boys will LOOOOOOOOOOOOOOOOOOVE! Love those! They would be great in corduroy too! Ps – Regarding your Twitter in the right hand column. Ditch the big trucks. But keep the matchbox cars. Oh! This pair is just too cute for words! I cannot wait to get started on a couple of these monkeys. In fact, the sooner the better (hint, hint – but definitely NO pressure 🙂 ’cause this grandmother hasn’t done any sewing in three years! Thank you SO much for coming up with this darling pair. WOAH!!! These are so freaking cute! Love it!! yay for a monkey pattern! your wee elephant (in lmpqg) is my go-to boy present. very excited for a monkey option! Adorable, and hooray for more boy/gender neutral gifts! I love these cuties! You are my sewing idol. I cant wait to get my hands on this pattern! THANK YOU!!!!! oooooooh! so so so cute. love ’em! the little hands! the curly tail! These little guys make me want one! oh so cute!!! you have the most wonderful imagination! On second glance, yes, I think Darling Petunia might have a point: there seems to be a little monkey-hedgehog combo going on. I am pro monkey-hedgehogs (monkhogs? Hedgekeys? ), lucky for you. OOHH Monkeys!! This Nonna has one monkey lovin’ 30 yr.old whose Christmas Stocking could use a sweet simian. And yes, I am still stuffing the last of the unmarried children’s stockings..Santa has to visit everybody, No? Your first paragraph describes me perfectly! Internet shopping can get so fussy. I am all for one-stop shopping to make a gift with a reasonable budget. The monkeys would definitely be a hit with little boys. yes, hedgehog, that was my first thought too. Either way they are darling and something boyish is always much appreciated. It seems I make 10x the girl stuff and my poor boys are neglected. Girl stuff is just so much fun! Curious George is the only tv my two year old gets to watch. And only nestled safely into the lap of his father. He simply calls the show Monkey. And he would love one of these! In a word, adorable! Thanks for sharing your inspiration . . . maybe I’ll get back on the (sewing) wagon here soon . . .
V. cute monkeys! And I’m so glad you’re thinking about boys on this one. I’ve noticed most crafters design/create for girls. Is that because most crafters are women? We should totally start a Joann’s $20 Christmas Challenge; complete with Flickr group! Okay, let me re-phrase…YOU should totally start a challenge, because no one but my sister ever reads my blog! I love thrifty crafting, and would love to see what everyone else could make with $20. oh, my, those are just darling!!! Can I be a pattern tester?! love. them. can’t wait for the pattern! Oh, the face is perfect. Very Very CUTE. You are really incredible. Thanks for sharing your talent with us. now that is a cute frikin monkey. where is the pattern? where? where? oh such a good idea, especially for right now, using more economical fabrics is in! And we could all probably find an old fleece jacket or blanket that’s seen better days. And hurray for boy ideas…keep them coming! OMG so cute! can’t wait to get a pattern for those!!! These are super awesome! I don’t envy you stuffing those tails!! I love your little monkeys! Oh, how i owuld to be able to make these for a few kiddos for Christmas! These monkeys are so frick’n cute! those are too freakin’ adorable! i want one for myself! Oh, how wonderful. I am just sewing a Pippi longstocking dress for my daugther and thought about a monkey 😉 You are sooooo clever!! !